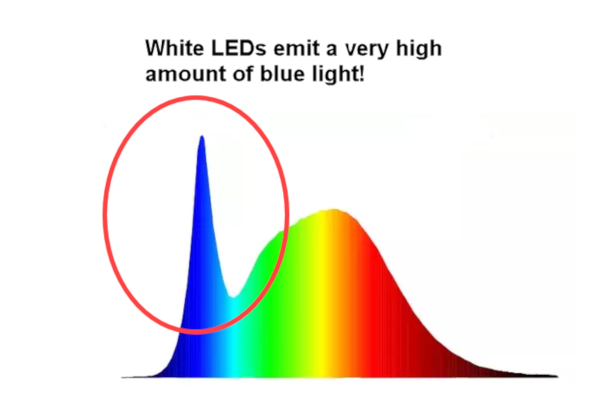 Did you know that white LED lights emit a whole lot of blue? Did you know that children are much more sensitive to blue light than adults? Most of us purchase standard night lights from the local hardware store or big-box store. These night lights are virtually all lit with a white LED. They are very energy efficient and much safer that the old incandescent night lights that would get really hot. However, white LEDs put out a LOT of blue light! Blue light at nighttime is now considered a public health risk by researchers around the world. Mountains of research are now telling us that blue light at night is incompatible with our biology. There are a range of problems linked with inappropriate light after dark. It's time to get rid of white night lights! We have WAY too much blue light after dark already. Enough is enough! Let's eradicate these little blue light generators from our homes. They have no place in the house much less a child's room. No circadian rhythm researcher would put a white LED night light in their kids room and you shouldn't either! The next best thing to total darkness in your child's room, is to use a red night light. 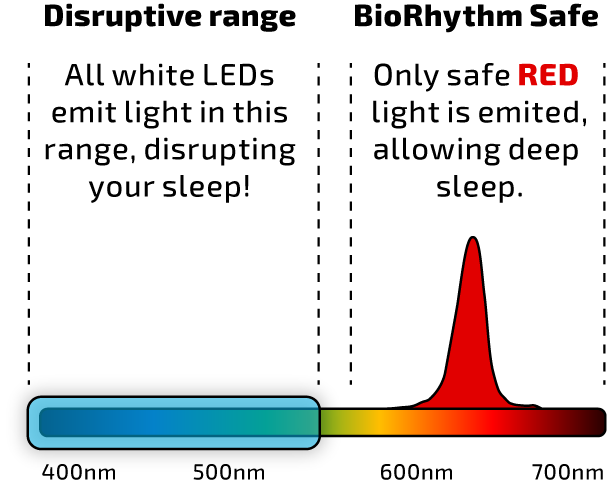 Red LEDs do not emit any disruptive blue or green light. They also preserve night vision which allows for getting around better in the middle of the night. With such a simple solution, we can easily stop this threat in it's tracks. By simply swapping out all the white LED night lights with red ones, we can mitigate a potential health hazard. "Are they getting exposed to blue light all night?" "Are their parents aware of the dangers?" You can too. We will help. Use the hashtag #NoWhiteNightLights on social media. We can also help by offering a discount to people who need it. You can also purchase in bulk at a discount to give away to friends and family. Biorhythm Safe red night lights make a great gift! Use the coupon code SHARE2018 during check out when buying 3 or more night lights. Buy 3 or more and get 25% OFF!